With his go-ahead two-run homer in Game 7, Cody Bellinger was a deserving NLCS MVP, but Yasiel Puig ribbed him for a perceived snub. Puig’s dinger in the 5-1 win was much funnier, though that likely doesn’t factor into voting consideration. The Dodgers held a 2-1 lead over the Brewers in the sixth inning Saturday night, when Puig added insurance with a three-run swat out of the park. The outfielder included a little bat flip and some crotch chops as he rounded the bases during Los Angeles’s 5-1 victory. Puig went 3-for-4 as the Dodgers took the pennant, and although he didn’t start every game in the series, he enjoyed himself and played loose. Sure, his looseness might not be as well-received in a scenario with such a thin margin of error as the postseason, and it resulted in a Travis Shaw double (which didn’t turn into a run) or a clumsy slide into third base, but the three-run dong helped make those mistakes forgettable. 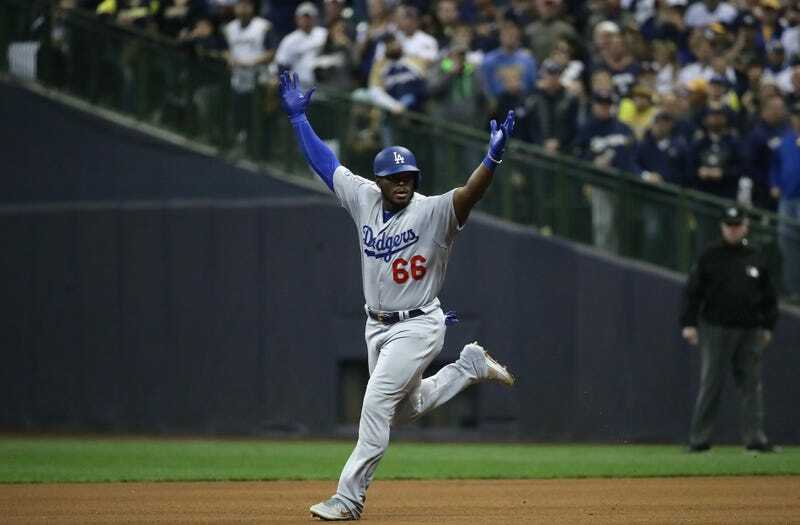 In Game 5, Puig had a similar moment of joy in a critical situation. With two runners on in the sixth, he came on to pinch-hit, licked his bat, and slapped a single to center to add on a run. As he ran to first, he raised his arms as if to say, See? I did that!